With the Super Bowl nearly upon us, just one last look at what could’ve been. Here’s a “snapshot” of the last offensive (and that can be read in either pronunciation) of the Packers season. While the ride we were treated to was certainly special, better than that of the fans of 26 other teams, and we should ultimately be thankful for that, it still stings when you look at this and wonder “What was Brett not seeing on this field?”, with two other receivers loosely covered and Ryan Grant UNCOVERED in the middle of the field, how does our future Hall of Famer not find one of them? God only knows, and I’m quite sure He’s as disappointed as the rest of us. Enjoy the Super Bowl, as anti-climactic as it may be…maybe you’ll pick up some cash in your office pool! Ah, yes the picture is there now…but is so painful to see! Hindsight indeed. You need to see the picture a second before. The timing between Favre and Driver was off on this play. It is not as bad as it looks. The saftey was out of the play and Driver was isolated. You have to think that he was going to make the play. Of course, I think the dump off to Grant was the play. 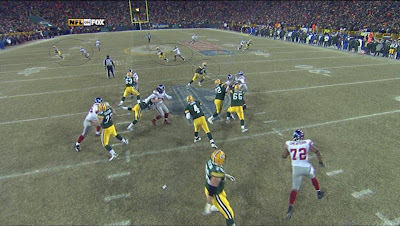 The guy on the right was obviously the check down and you can’t expect Favre to be able to see both at the same time. When I saw this reply I thought the best play was the past to Lee down the middle. Now I am not so sure Favre would have been able to shift his feet fast enough to make the play with the pressure up the middle.